From an altitude of about 100 metres, the drone recently acquired by the Design Office and Patrimony service (SMB-SE-DOP) took over 6200 aerial photos of CERN’s Meyrin and Prévessin sites in two days. The images were then put together using the principles of photogrammetry in order to produce orthophotos (photos geometrically rectified in order to create 2D maps). You can find them at maps.cern.ch and gis.cern.ch. The level of detail, as you’ll see, is remarkable. The resolution is 1.5 cm per pixel, between four and ten times the previous level of precision. Before the service acquired the drone, photos were taken from a plane in the framework of a partnership between CERN and the SITG, the Geneva geographical information system. These photos, which are still used in areas outside the fenced part of the CERN site, offer a lower resolution of 6 to 15 cm per pixel and are updated only every two to four years, not enough to build up a real geomatics tool like the one available today. To keep the maps up to date, the Design Office and Patrimony service intends to photograph the CERN sites every year. These updates will also play an important role in documenting the history of CERN. 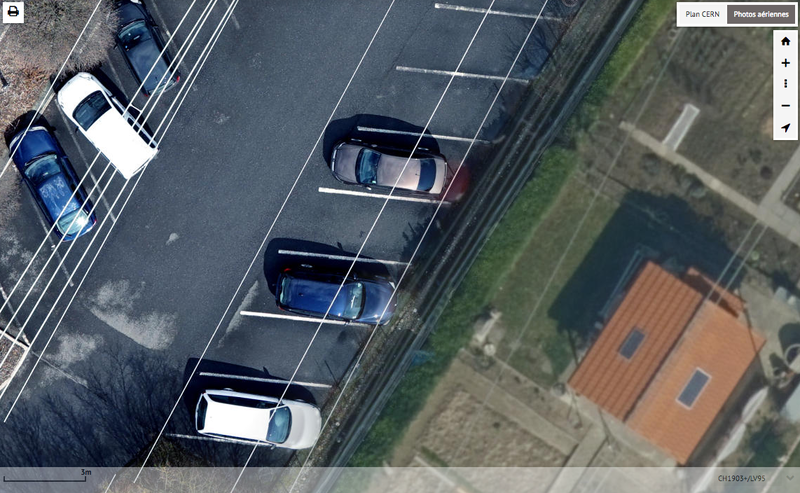 “The incredible precision of the photos means that we are now able to create maps directly from digital photos of objects such as road markings, curbstones and manholes,” explains Youri Robert, the geomatics engineer in charge of the service. “Using these images we can make digital elevation models (DEMs) virtually automatically, with a topographic accuracy of better than 3 cm in the case of hard surfaces. This saves a huge amount of time when it comes to producing topographic drawings for preliminary design studies.” These digital models are also used to calculate the volume of material in large-scale earthworks, such as those for the HL-LHC project, and so to check how much earth has been excavated and stored without having to physically inspect the worksite. Discover the new aerial photos of CERN at maps.cern.ch or gis.cern.ch or, if you require your own aerial photos, send a request to "Drone Mapping".